Heat oven to 350°F. Place oven rack in lower third of oven. Remove rolls and icing from can; set rolls aside. In 10-inch cast iron or ovenproof skillet, melt 4 tablespoons of the butter over medium heat. Stir in brown sugar and icing. Heat 1 to 2 minutes or until icing is melted; remove from heat. 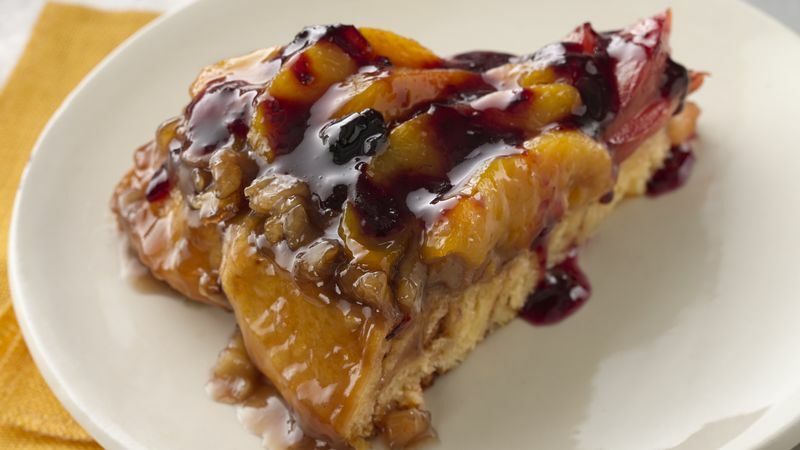 In skillet, arrange peach slices over butter mixture around outer edge, overlapping slightly. Arrange plum slices in center of skillet, overlapping slightly. Top with nuts. Separate dough into 8 rolls. Using sharp knife, cut each roll horizontally into 2 rounds. Place 12 dough rounds over fruit around outer edge of skillet, edges touching. Place remaining dough rounds in center of skillet. Cut remaining 2 tablespoons butter into small pieces and place on dough. Bake 30 to 40 minutes or until deep golden brown. Cool 5 minutes. Run knife around edge of skillet to loosen cake. Place heatproof serving plate upside down over skillet; carefully turn plate and skillet over. Remove skillet. In small microwavable bowl, stir preserves and 1 tablespoon water until blended. Microwave on High 30 to 60 seconds or until mixture boils. To serve, cut coffee cake into wedges. Drizzle 1 tablespoon preserves mixture over each wedge. Serve warm.